Take your fundraising to new heights with Aplos. Fundraising is About Building Relationships. At Aplos, we believe in changing the world by making it simpler to manage nonprofits and churches. We make it faster and do the hard part so you can focus more on your mission. Aplos makes nonprofits simple. At Aplos, They believe in changing the world by making it simpler to manage nonprofits and churches. It makes it faster and do the hard part so you can focus more on your mission. It's no coincidence that Aplos meets the needs of nonprofits .That's exactly who they build it for. Create detailed donor profiles with personal information, communication notes, and historical giving data. Monitor your donor's activity as they progress from potential donors to active, recurring donors. Quickly generate reports to monitor your fundraising efforts and specific groups of donors that need more nurturing. Track your donations directly in your accounting to better assess your giving trends overtime. Create custom donation forms to process donations online using credit card or ACH transactions. Allow your donors to give recurring donations, as well as manage their account through a donor portal. Quickly print or email your contributions statements with the click of a button. Create more opportunities to gain committed donors by offering the option to pledge gifts. Easily link Aplos to your PayPal account to track your giving. Get suggestions communicating with donors so you never miss an opportunity to build or repair a relationship. Filter your contacts to create custom lists of email addresses for specific email campaigns and mailings. Create and send personalized emails within Aplos, as well as batched letters for portal mail. 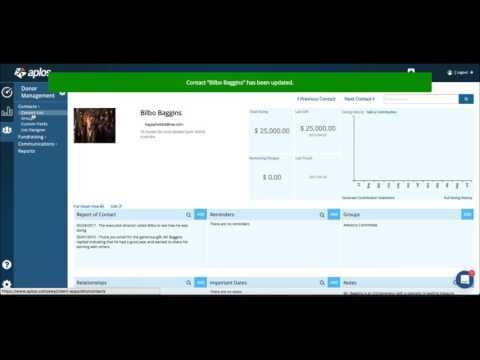 Do you want to learn more about the all new Aplos Donor Management? Check out this recorded webinar with Dan Kimball and learn everything you need to know to simplify your nonprofit!